Also serving communities of Herrin, Vienna, Metropolis. There are 7 Assisted Living Facilities in the Marion area, with 5 in Marion and 2 nearby. The average cost of assisted living in Marion is $3,087 per month. This is lower than the national median of $3,346. Cheaper nearby regions include Benton with an average starting cost of $2,375. To help you with your search, browse the 21 reviews below for assisted living facilities in Marion. On average, consumers rate assisted living in Marion 4.1 out of 5 stars. Better rated regions include Carbondale with an average rating of 5.0 out of 5 stars. With a population of 17,803, Marion is a fairly small town. Seniors make up a whopping 25.8 percent of the population, and there are nine assisted living facilities to meet their needs. Assisted living facilities (ALFs) in Illinois are defined by the Illinois Department of Public Health as those housing three or more unrelated persons, 80 percent of whom are at least 55 years old. This government agency also oversees licensing and inspections of ALFs, including the nine ALFs in the Marion, Illinois area. The Marion, Illinois area is home to world-class medical facilities including Heartland Regional Medical Center and the Marion VA Medical Center, in the event of medical emergencies or illness. Located in south-central Illinois, Marion is known for having four distinct seasons, including hot summers and cold, snowy winters. The average high January temperature in Marion is 38 degrees Fahrenheit and July brings highs of 87 degrees Fahrenheit. Marion has an array of community resources for seniors, including the Williamson County Programs on Aging, an organization that offers meals, healthy living classes and discounted transportation to seniors age 60 and older, as well as a senior center. Crime in Marion is a major problem, as it is in many other parts of Illinois. The overall crime rate in Marion has risen by eight percent in recent years and is currently 16 higher than the national average. For those seniors who drive, Marion is located right on I-57, which connects the area to Chicago to the north and Cairo, Illinois to the south. For public transportation, Rides Mass Transit provides on-demand bus service with at least an hour's advance notice. The company offers reduced fares for seniors age 60 and older. There are many fun and interesting things to do in and around Marion, Illinois. These include the Crab Orchard National Wildlife Center, the Williamson County Historical Museum, Mandala Gardens and the Shawnee National Forest. Most Marion events and attractions offer some sort of a senior discount, although the qualifying age varies. Assisted Living costs in Marion start around $3,087 per month on average, while the nationwide average cost of assisted living is $4,000 per month, according to the latest figures from Genworth’s Cost of Care Survey. It’s important to note that assisted living rates in Marion and the surrounding suburbs can vary widely based on factors such as location, the level of care needed, apartment size and the types of amenities offered at each community. Eligible seniors who live in Marion, Illinois can turn to a number of state and federal assistance programs for help with the cost of assisted living. 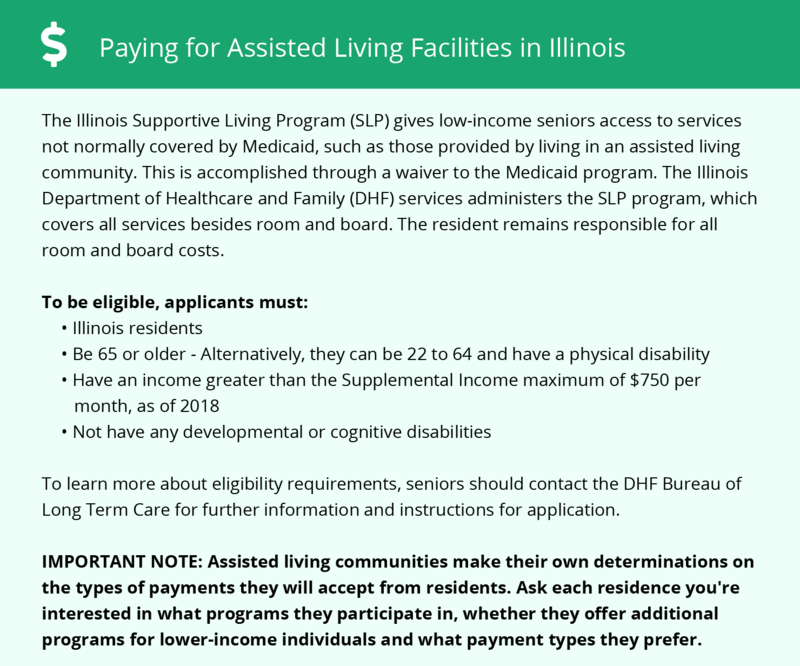 These programs include Choices for Care, the Illinois Supportive Living Program and Supplemental Security Income Category G.
Marion and the surrounding area are home to numerous government agencies and non-profit organizations offering help for seniors searching for or currently residing in an assisted living community. These organizations can also provide assistance in a number of other eldercare services such as geriatric care management, elder law advice, estate planning, finding home care and health and wellness programs. To see a list of free assisted living resources in Marion, please visit our Assisted Living in Illinois page. Marion-area assisted living communities must adhere to the comprehensive set of state laws and regulations that all assisted living communities in Illinois are required to follow. Visit our Assisted Living in Illinois page for more information about these laws.